Great, I hope I don't get a fine though! Can you tel me where did the 70% come from .it is something iv all ways wonted to no when talking %. Hi Paul, we calculate the percentage by comparing the total volume of letters issued each month with the number of customers who pay via the online channel. So in this case, each month over 70% of the customers who pay will do so through the online channel. How about disputing the fine online with the photographic evidence. Thank you for your suggestion Debbie, we're currently transforming our services and we'll look into the possibilities of introducing an online dispute process. Good idea,has the recovery of fines increased using this method? Hi Brian - yes, customers are also paying their fines earlier as now they can do this at their convenience with a 24hr service, compared to the 9 to 5 office hours of DVLA's contact centre. Exciting new ways to pay a fine? Really? this must be the saddest piece of email literature I have ever read. Has email communication really stooped to this inane level? If you can’t think of any more factually accurate way of presenting this kind of information - please don’t try & dress it up like some sort of new lottery scratch card ! when reporting an untaxed vehicle, could there be a link to upload a photo of the reported vehicle to help prove the validity of the report. Thank you for your suggestion Mr Merrick, we're keen to improve the ‘report an untaxed vehicle’ service and will explore this possibility as part of transforming the service. How are we supposed to know when a vehicle is or is not taxed since the stupid idea of doing away with the tax disc? it was the best and easy way, to check,nowadays you just cant't tell. Has the number of untaxed vehicles gone up since this retrograde step was taken? 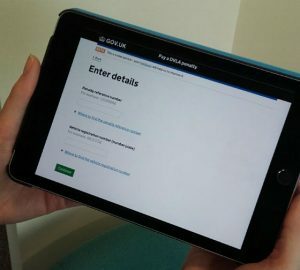 Hi Brian, if you want to check if a vehicle is taxed you can do so 24 hours a day online at https://www.gov.uk/check-vehicle-tax. Currently almost all vehicles on the road (98%) are taxed correctly. We collect around £6 billion in tax every year - clearly showing that most motorists stay legal and tax their vehicles on time. Always looking for simpler ways when it comes to online management. Hi Trev, thanks for your feedback. With your V5C, see https://www.gov.uk/vehicle-log-book which tells you how long it takes to get a replacement V5C (it differs depending on how you applied). It also says when and how to contact us if you haven't had it. Making things easier is always a good idea, for DVLA to take the lead is excellent. I have used the TAX MY CAR service many times, very easy. Taking into account customer feedback to a government agency and ACTING on it is a first. Yes folks DVLA should be congratulated on this approach on being THE FIRST to consider"customers". "We’ve just made some exciting new additions". I guess the language used betrays the pleasure you experience from persecuting drivers in ever easier ways with quicker rewards for you. Excellent work. It's great to see "OEPP" blossoming! Great, how out of touch are you to be “excited” about making it easy to fine people. You should be concentrating on prevention of offences. Still to do so would mean legislating away your jobs and that would never do would it? Hi Roy - we're looking at ways to help prevent people committing an offence, but for those that do, we want to make the process of putting it right as easy and simple as possible. Does this include penalty points on License. Hi Monty, thank you for your suggestion. For info, for some types of fines the amount owed does increase after a certain period of time. I have read all the noted comments.............. As an individual, and as 'one' representative working within the road haulage industry, I think it pertinent to thank you and your teams at the DVLA, 1) for your attention to detail, 2) for the replies and time taken to respond to ALL general enquiries, positive and negative. I guess "the language they use betrays the pleasure they experience from persecuting "theoretical drivers" of the industry" i.e. those who “actually try” to make a difference! Well done DVLA Team, the simplicity of the online services/tools now being made available to the public are a positive step forward. Personally, I have only had dealings with the DVLA when I have done something wrong, any previous incidents or action taken against myself have been warranted and evidenced to me. So, in my case I thank you for taking the time to evidence my wrong doings and explaining the errors/mistakes I have made. Each incident has enabled me to prevent recurrence. 1) hostility and ill-treatment, especially because of race or political or religious beliefs; oppression? 2) persistent annoyance or harassment? Rightly or wrongly thank you for doing your jobs, thank you for the API Platform – VES, Alexa product, online services, and finally I would like to thank you for keeping me in the loop and for promoting a culture of independence and freedom. Appreciated, accepted, continue moving forward. Hi John, We don’t accept instalments and enforcement action will continue if payment is not received, the course of enforcement action depends on the type of penalty. Please call or write to DVLA using the contact details provided in your letter.